Bob Dylan has been rocking my world for a long time now. I have read dozens of books about Dylan. In less than a half hour I learned more about Dylan and his muse than in all those books combined. He explains how three great works of literature informed and inspired his art. This is not a normal lecture – this is a long poem. 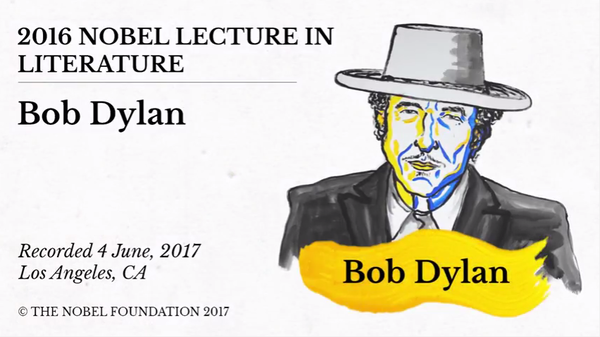 If you have the slightest curiosity about where Dylan’s lyrics come from, this is the great reveal. All of which makes it somewhat painful that he appears to have cribbed some of his speech from Spark notes. Some of the words and phrases he used aren’t in the book but are in that condensed guide. I wonder if, on receiving a literature award he felt some pressure to quote literature. I’ll still listen but for me, sadly, a bit tainted.